-Mentha Viridis. 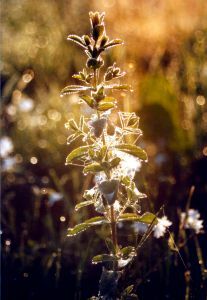 �Spear Mint has several round stalks, and long narrowish leaves set thereon, of a dark green colour. The flowers stand in spiked heads at the tops of the branches, being of a pale blue colour. The plant has a fragrant smell, and a pleasant aromatic taste. It is cultivated in gardens. Its roots are abundant. It is valuable for its carminative and aromatic properties which reside in its volatile oil, of a pungent and peculiar odour. Dioscorides says it has a heating, binding and drying quality, and therefore the juice taken in vinegar, stays bleeding. It dissolves imposthumes being applied with barley-meal. The application of the juice mixed with honey relieves pains in the ears, and roughness of the tongue. Applied to the forehead and temples, it relieves pains in the head, and the heads of children, against breakings-out, sores or scabs. The whole plant is used fresh or dried, and is excellent for flatulency, sickness, vomiting and weakness of the stomach. It generally stops vomiting and creates an appetite. Some apply the fresh herb bruised to the stomach for the removal of its com�plaints. Bruised and mixed with salt it is said to cure the bite of a mad dog. Given as an infusion it has relived diarrhoea. The decoction gargled in the mouth, cures sore gums and mouth. I have frequently cured young ladies of relaxed and consumptive habits by ordering them to go with the maid a milking for a few mornings, and take with them a new laid egg beaten up with a table-spoonful of Rum, and a little Spear-Mint cut small, to which add a tea-cup full of new milk from the cow. This drank in the field, and the morning air have done wonders.